We celebrated Labor Day today with a small pool party. Where we are in Arizona, we probably have at least another month of pool weather to enjoy, which is awesome! But, any opportunity to sit around the pool with good friends and drinks can't be passed by! 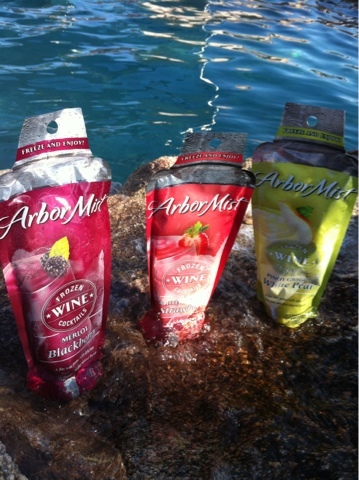 Thanks to Arbor Mist and SheSpeaks, I had some new beverages to try. 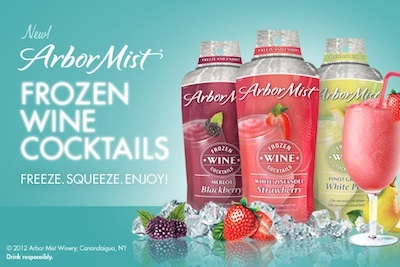 As part of a review program, they sent me 3 different varieties of Arbor Mist's new frozen wine cocktails -- Blackberry Merlot, Strawberry White Zinfandel and White Pear Pinot Grigio. I love slushy drinks and these packages take all the work out of it for me! Simply pop the package into the freezer for a few hours (or a few days) and when you take it out and tear off the top, you'll have a perfectly slushy, icy, cool drink to enjoy. We enjoyed all 3 varieties today and were pleased with the flavors. They were the perfect drink to partake in at poolside. I really enjoyed how easy they are, since there is no preparation needed except to squish the packet a little bit before pouring into a glass. Their alcoholic content is similar to the Arbor Mist wines - 6%. The sugar content was high in all 3 varieties, and they were pretty sweet, but as an occasional treat I think they are fun and tasty. They are something that I will definitely keep on hand in my freezer for when we have guests over. You can find locations to buy them at the Arbor Mist website.